The London Evening Standard says Suarez has not given up hope on moving to Real Madrid, raising the prospect of Arsenal missing out on their prime transfer target. 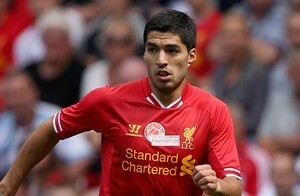 Arsenal feel they have triggered Suarez’s buyout clause with their £40,000,001 bid made earlier this month. There is a belief in Suarez’s camp that Real’s interest could be revived were the Premier League to rule in his favour and effectively set his price at one pound over £40m.